Every once in a while everyone wakes up with puffy eyes in the morning. With me, it’s the other way around. Every once in a while I would wake up with eyes that weren’t puffy. Doctors tested me for all kinds of potential causes, and we finally came to the conclusion that it’s a hereditary problem which runs in my family. My Mom’s puffiness developed into large bags under her eyes as she got older, my brother has them too. Over years of modeling I tried every possible remedy so I could show up to a photo shoot not looking like I had a late night out. I stopped partying, cut out alcohol, was getting 10 hours of sleep every night, and still it would not make a token of difference. The worst puffiness would occur right before my cycle, when women’s body retains the most water. This problem caused a lot of stress and frustration, and I was eager to try every trick in the book. Eventually with time I discovered some remedies, that helped keep my puffiness in check. But until then I often became a victim of common mistakes and misconceptions. It is a very common misconception, unless you have chronic kidney problems. Dehydration can actually be one of the main causes of puffiness and swelling of the eye area. When your body is dehydrated, it will try to retain water, and that results in puffiness. The first cure for puffy eyes is drinking plenty of water. Water with a slice of lemon in the morning is great! Lemon contains electrolytes beneficial to hydration and has an alkalizing effect on the body . While ice in general will help to take the puffiness down in the morning, you should NEVER PUT THE ICE CUBES DIRECTLY ON YOUR SKIN, even if in a plastic bag. I learned that a hard way by giving myself freezer burn on the lower eye lids. You can use an ice pack, but only over a wash cloth. Ice water can be a great safe alternative: you can soak cotton balls or a wash cloth in ice water, and literally “chill” for 10 minutes with your eyes closed. Once I showed up to the set with an extensive puffiness. The make up artist I was working with wasn’t very happy about it, and she suggested I try using witch hazel on my eye lids the next day. Well, I should have known better, my skin is very sensitive, and naturally, I ended up with some redness and irritation. 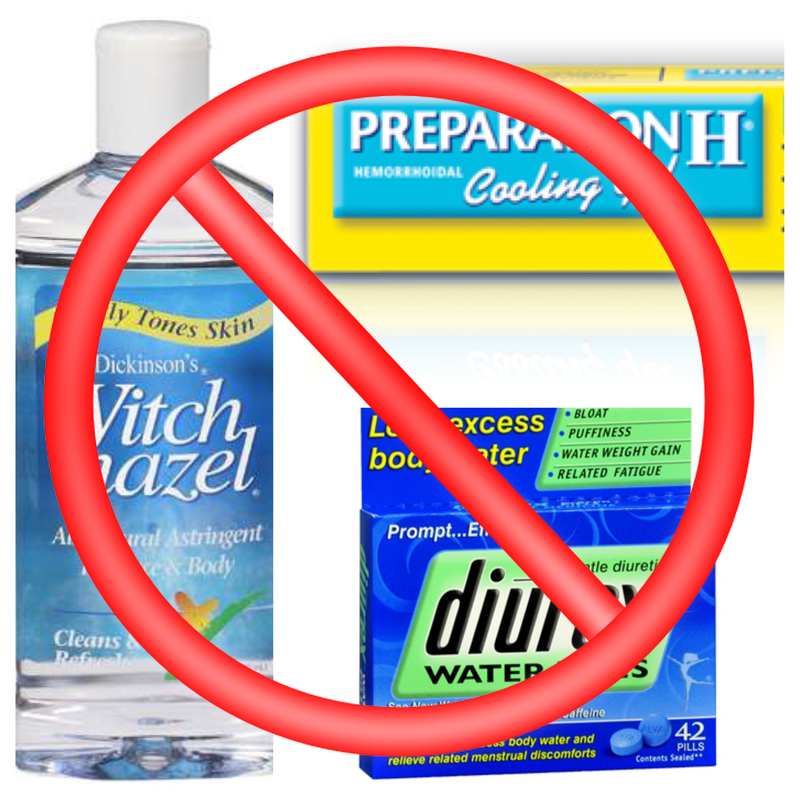 On another occasion I tried Preparation H… In theory it could work, however it did not do a damn thing for me, except for the cooling effect, as the cream just came out of the fridge. I also learned later, that one of the ingredients of Preparation H, a yeast derivative that is supposed to reduce puffiness, is no longer found in the version that’s available in the U.S. (The cream was reformulated in 1994.) And here is the worst part: it got into my eye, which was extremely irritating! All I can say, puffiness became the least of my concerns on that morning. Now I have a new rule: I NEVER USE SUBSTANCES ON MY EYES THAT DON’T BELONG IN THE EYE AREA! A few years ago I was very frustrated with puffiness and swelling, and a the last resort, I picked up a pack of water pills and started taking them a night before a big photo shoot. While I was feeling ok at first, on the morning of my big job I woke up having unusual symptoms. My heart was beating irregularly, I was feeling weak, dizzy and nauseous. What a night mare! Despite beeing sick, I had to gather myself together and report to the set. The bottom line: water pills did not make the bags under my eyes go away, but gave me so many side effects, that I could barely make it through the day. As you can see, I truly made every disastrous mistake out there. I hope that my readers won’t fall into the traps of common beauty myths and misconceptions. In my next post I will talk about the immediate remedies and some long term solutions for puffy eyes. New post on Irina’s beauty blog. Puffy eye mistakes.